My friend and fellow Milwaukee-based blogger, Phi of the blog SweetPhi, has invited me to participate in my first “blog hop giveaway”, and I’m really excited to be a part of this clever concept! Essentially, you will have opportunities to win fabulous prizes – not only on my blog, but on other participating blogs as well! See the list below. Since February is often thought of as the “month of love”, or at least associated with Valentine’s day, and the local MKE blogger network is “spreading the love”, for my first giveaway, I’m going to send one lucky winner a fun and functional heart-shaped piece of Wisconsin bake ware pottery from Rowe Pottery Works, based in Cambridge, WI. It’s always a nice feeling to support local businesses. Rowe Pottery Works is located just about an hour west of me. You can bake your loved one(s) a heart-shaped dessert, or use the adorable dish to serve appetizers, dips, and other snacks. If you’re like me, you never really have enough good serving dishes. In my opinion, this one seems perfect to use at an intimate gathering. It will also show well just being placed on a shelf or used as an everyday candy dish. Speaking of candy, I’ve also included a bar of Milk Chocolate Sea Salt by Indulgence Chocolatiers, based right here in Milwaukee. And, since wine and chocolate go hand in hand (and I can’t legally ship wine), I’ve included the wine stopper pictured above. It’s silver and red and the message reads “Charming, Seductive, & Pleasing”. Perfect for that bottle of wine you can’t finish in one evening! As a bonus… I’m also going to include a tried and true secret family recipe with this dish! This is a “dessert” that is great as a an after-meal dessert, as well as a morning coffee cake. And, shhhh, it’s not a difficult recipe! You may enter below by tweeting about the giveaway, liking and leaving a comment on the “She Ordered What?” page on Facebook, following me on Twitter, or by leaving a comment about why you’d love to win these prizes below. The giveaway contest will end at 11:59PM on February 9th and the winner will be randomly chosen on February 10th. I will notify the winner on February 10th. I encourage you to visit other participating blogs to discover fantastic recipes and enter their giveaways! Sweet Phi for a chance to win a WI shaped cutting board, a box of chocolates and a $10 Starbuck’s gift card. Karis’ Kitchen is giving away two “Sweet Treats” boxes filled with an Indulgence Chocolatiers bar, candied pecans from Treat Bake Shop, and a jar of caramel sauce (plus caramels) from Becky’s Blissful Bakery. The Frosted Vegan is offering up a chocolate bar from Indulgence Chocolatiers, a jar of smoked paprika from Penzey’s Spices, and a bag of Collective Coffee Blue Heeler blend. Almost anything red from a wine perspective. I’m not a wine tasting pro, so even something cheap will taste similar to something expensive to me. Nice, Ant! Next time I see you, we’ll have to have some wine. I particularly love Cabs and Malbecs. Cheers! I love love love this idea! What a great way to promote your blog AND give away some awesome items from the state you love! Hope I win! I’d love to use that dish to make a heart shaped sweet treat! Thanks so much for your comment, Tess! I’m considering buying this dish for myself too. I just think it’s so cute! I love this dish! Can’t wait to see the recipe you share for the winner. ( Hope it’s me! ) The wine stopper will be a great gift for my sister in law she loves unique stuff to go with her wine. Thanks for the chance! I’m glad you I chose wisely, Tina. 😉 I love the dish too! That heart shaped dish is so pretty! I would love to win it and the chocolate, since I haven’t tried Indulgence yet! Glad you like the dish, Lisa! And, everyone deserves a good chocolate, right? Since you’re a fitness gal, I thought I’d share that I use Push-Up Warrior, Ab Workouts, MapMyRun, and Running for weight-loss. What did we ever do before apps?!? 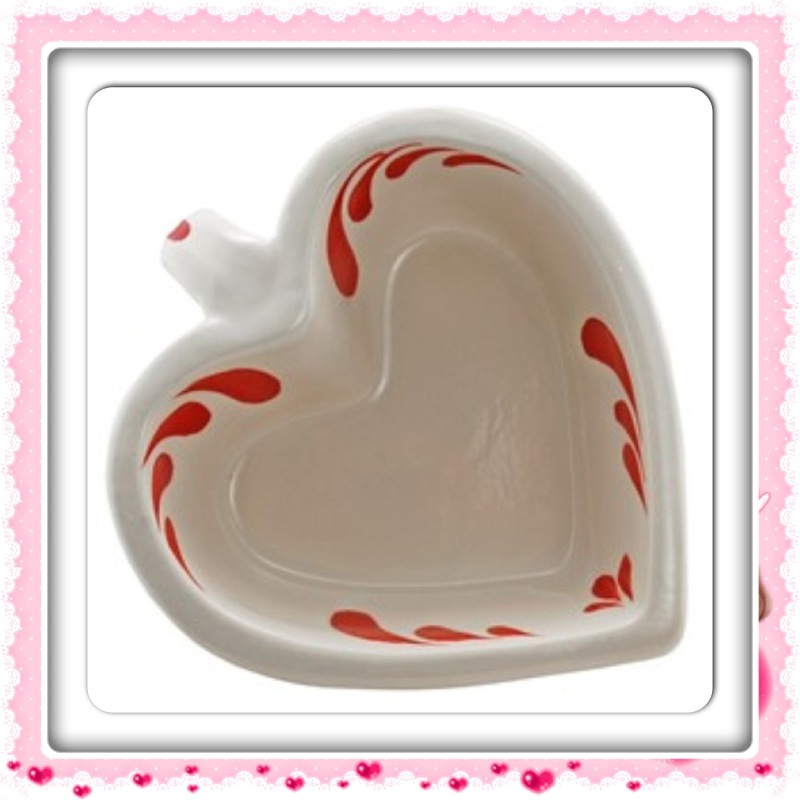 I love the heart dish and I love tasty chocolate so thins is a giveaway for me. Thanks so much! Thank you for entering, Rachel! These are perfect for Valentine’s Day, and I love to support Wisconsin businesses. I thought so too, Barb. 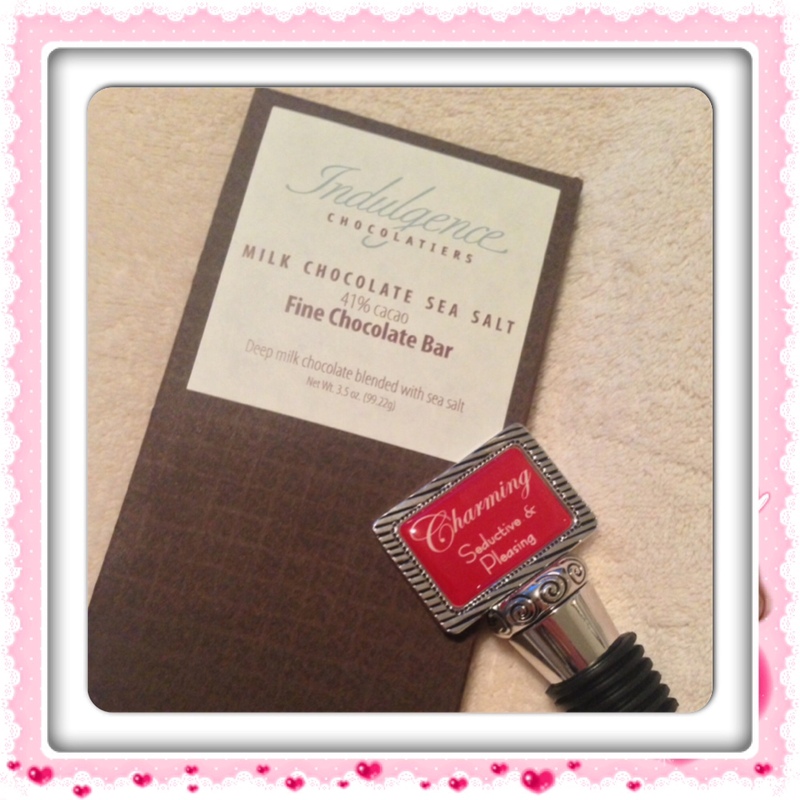 It was nice to use local products to make a Valentine’s Day theme prize. I also love supporting wisconsin businesses and always need wine bottle stoppers! I’m with you, Alison. I love having cute accessories for parties or entertaining. Wine stoppers and charms are fun to collect, IMO. Thanks for entering! The chocolate goes in the cute dish ready to eat, the stopper is in case there is any wine left, all that’s needed is a party with me, myself and I, or maybe a friend. The theme of the party could be salute to WI. I love that you are promoting Wisconsin made items! Your giveaway prompted me to look at their websites. Thank you! I follow you on Twitter as @normawatson. Thank you so much for offering such a lovely and generous giveaway. I “liked” you on Facebook and left a comment on the giveaway post. It’s great to see your excitement and enthusiasm, Cindy! Thanks for entering the contest. I hope the winner, whomever he or she is, will enjoy the recipe I’m sending. It’s not the most difficult or a nod to my ethnic heritage, but it’s been a people-pleaser in my experience! I hope you find many gems amongst your latest “secret recipe” haul! I got married to a wonderful woman this past Summer and I think any of these awesome items would thrill her for our first V-day as a married couple. Thanks! What a lovely thought, Adam! Congratulations on your recent(ish) wedding, and thank you for entering the contest. How fun, Jennie! Happy birthday (a bit early)! And, thank you for entering the giveaway. 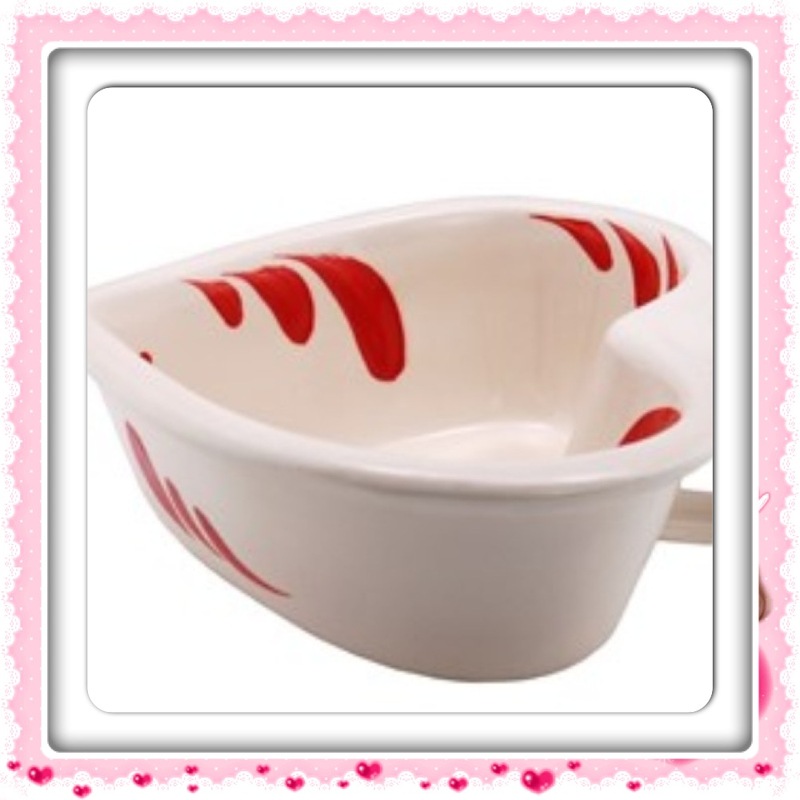 That bowl is so pretty and would be great to use for Valentine’s Day! I agree, Nicole! I’m excited to see who wins tomorrow. Thank you for entering the giveaway! I would love to win because chocolate and wine are my two favorite things! Thank you very much! A woman after my own heart, Amanda! Congratulations to Amanda S! 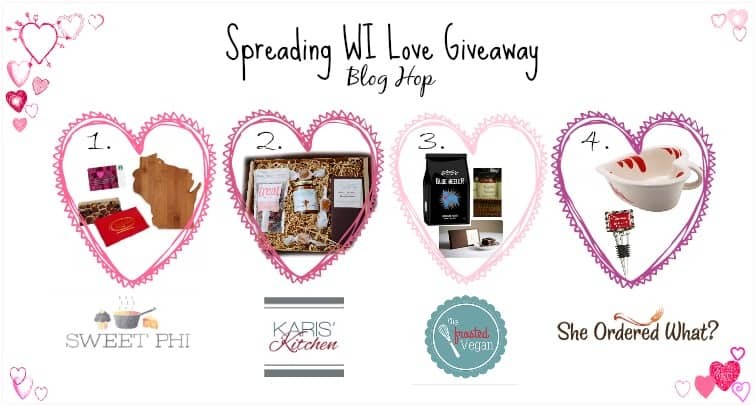 You’ve won the Spreading the WI Love giveaway! I’ve contacted you via email as well. Thank you all for entering the giveaway. This has been really fun for me and my fellow bloggers!